The Olympics are upon us! Hooray! This post marks the last Throwback Thursday post for the Sochi Olympics. The next Throwback Thursdays will come if this blog is still alive in 4 years for Pyeongchang 2018. For my last Throwback Thursday post, I wanted to feature skaters who I thought exemplified the best of the Olympic spirit. Firstly, it must be said that Shen & Zhao’s success grew out of someone else’s resolve after their own personal failures. That person, is their coach, Bin Yao. Bin Yao’s story is a favourite among commentators: back when Bin Yao was a pairs skater himself, China was still quite closed off to the rest of the world and figure skating was indeed a very foreign sport in China. Yao could only learn about pairs skating elements through photographs in books. In all their competitions, Yao and his partner never did very well – in fact, the audience was laughing at them at the 1980 World Championships. However, 30 years later, Yao established himself as one of the foremost coaches in pairs skating and he has single-handedly turned China into a pairs powerhouse. At the Vancouver 2010 Olympics, his students placed 1st, 2nd and 5th. Now, Shen & Zhao coach alongside Bin Yao, inspiring and improving the next generation of Chinese pairs skaters. Shen & Zhao is a beautiful team not only because of their love for each other but for the love of their sport. At the Vancouver 2010 Olympics, they were aged 31 and 36 respectively. In terms of pairs skating, that is considered to be very ancient since the competitive life of a figure skater is short. The sport is dominated by teenagers and skaters often retire by age 25. Injuries are not unusual and in a discipline that requires athletes to throw or be be thrown around, being young is always helpful. Yet, despite all of this, Shen & Zhao persevered, set records throughout that season and became Olympic Champions. 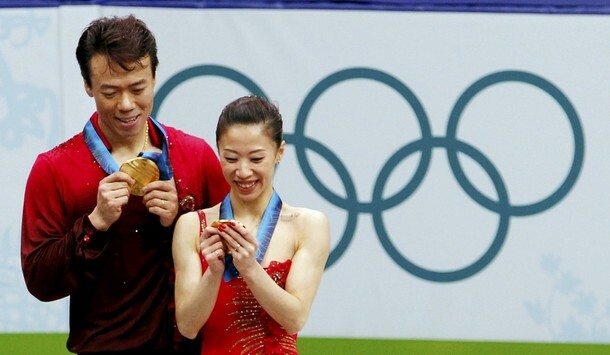 For showing us that the impossible was possible, for showing us that age does not always prevent you from triumphing in a sport ruled by teenagers and for inspiring a new generation of skaters with their resilience, love of sport and ambition, I present to you Xue Shen & Hongbo Zhao, the last athletes for the Sochi 2014 Throwback Thursday posts. The Olympics are here! Are you excited? It’s another Thursday, and Sochi hasn’t arrived yet so it means that… it’s Throwback Thursday time! Each Thursday before the beginning of the Sochi Olympics, I will feature a program/skater/team from the last Olympics just for fun. This week is a little unusual because I’m not showcasing a particular program or skater(s) per se, but I’m commemorating segments in the ice dance competition that don’t exist anymore. There used to be three segments in ice dance and starting in the 2010/2011 season, that number was reduced to 2. Two segments of the dance competition, the Compulsory Dance (CD) and the Original Dance (OD) were eliminated and in a way combined to make the Short Dance (SD) we see today. I wasn’t a fan of this team at all in Vancouver but I agree with the judges that they had the best Tango Romantica of the night. Domnina’s long limbs and regal presence gave it that extra touch even though the other two teams featured below got tips from the dancers who created this pattern. Were you happy that this part of the competition was gone? The other dance that was eliminated was the original dance. In the original dance, skaters must perform a program to a rhythm set by the ISU every year. For the 2009/2010 and consequently the Vancouver 2010 Olympics, the rhythm was folk or country. While competitors can chose their own music but within a certain tempo range. (I’m a little sad that the ISU decided to get rid of the OD since the 2010/2011 rhythm was supposed to be rhythms and dances from the 50s, 60s and 70s. Disco Fever!) In any case, here were the ODs from the podium finishers except for Domnina & Shabalin because I can’t find their Olympic OD on youtube. You’re not missing much… their OD cause quite an uproar because it was supposed to be an Australian aboriginal dance but the pair didn’t do their research well and the program offended a lot of aboriginal groups. I love that Indian/Bollywood OD. That was a great program choreographed by Marina Zueva. Do you guys miss the CDs and ODs? Or do you prefer the new short dances? Let me know in the comments! It’s Throwback Thursday time! Each Thursday until the Olympics, I will feature a skater/team/program from the last Olympics. This week’s Throwback Thursday skater is Mao Asada. This may come as a surprise to some, especially since Mao’s programs that season weren’t quite suited to her and weren’t artistic masterpieces by any stretch of the imagination. There’s also the obvious reason that she was eventually beaten by Yuna Kim who skated brilliantly at the Olympics. However, for this Throwback Thursday I just want to celebrate the small contribution that Mao has made to innovate and advance ladies figure skating through her accomplishments during the last Olympics. Let’s take a look at her programs from the last Olympic season, shall we? What was so impressive about this set of programs is the total number of triple axels she in from both programs: 3. She was the first lady in history to do this as the triple axel has rarely been done successfully in competition by the ladies. For anyone who has read my Skating 101 post on jumps, the axel is the most difficult triple jump. Many elite men, including the Olympic champion, Evan Lysacek and current World champion, Patrick Chan have struggled with this jump. But what exactly was Mao’s contribution to ladies’ figure skating? A combination jump with a 2 and 3 rotations or two jumps with 3 rotations. A jump with 3 rotations. If you’ve read my Skating 101 post on program elements (coming soon! ), you’ll know that this list is slightly different nowadays as ladies can do EITHER a double OR triple axel in the short program. I believe at the end of the 2009/2010 season, the Japanese figure skating federation argued that if one lady could do the triple axel in competition, then all ladies should be able to attempt the 2A or the 3A just as the men can in their short program. The bid for this rule change was successful and now, ladies are allowed to attempt a double or a triple axel in their SP as part of the requirements. There has yet to be a lady other than Mao who has taken advantage of this rule but at least the possibility is there and who knows, maybe one of the upcoming Russian phenoms will surprise us. What do you think of the rule change? Let me know in the comments! It’s Throwback Thursday time! As a countdown to Sochi, I will be posting a program from the previous Olympic season every Thursday~! And off we go! This week’s Throwback Thursday program comes courtesy of Aliona Savchenko & Robin Szolkowy. When Vancouver 2010 came, many were expecting them to do well, if not win the Olympic gold, as they were the World Champions the season previous. Technically, they were a slightly above the rest and when they skated well, they were great. All of that changed when the legendary Shen Xue & Hongbo Zhao came back from their retirement and Savchenko & Szolkowy seemed shaken to the point of no recovery. When the Grand Prix Final of 2009 came along, it became clear that Shen & Zhao had taken their place as the favourites for Olympic gold. Still, despite their struggles that season and what must, to them, be a disappointing Olympic bronze medal, I really loved their long program to the music of Out of Africa. I actually have something of a personal connection to this program. If you remember, Savchenko & Szolkowy skated to a different LP at TEB that year with hideous costumes and came back with this lovely program. I was actually able to attend Skate Canada that year and I watched this program, though not live. Due to some miscommunication, a friend of mine who went to SCI2009 with me bought a ticket to the ice dance OD and pairs LP event when another friend (incidentally, friend and commenter, Ay-sa) and myself hadn’t. To rectify the situation, I bought a ticket to those events and split the price between Ay-sa and I because we were both poor students then and couldn’t afford to buy another whole ticket. We decided that since I was more interested in ice-dance, I would go to the OD while Ay-sa would take my ticket and watch the pairs LP. While she did that, I sat in the lobby to do some homework I brought to Kitchener. Eventually, I found out that there was a TV screen showing the pairs LP in the lobby and I got totally distracted – I kept looking for the score every 10 minutes. Eventually, I gave up on the homework and watched the event. Savchenko & Szolkowy were the last to skate and for four minutes, I was mesmerized, along with the rest of the people watching in the lobby. Samuel Contesti seemed to notice that and tried to creep discreetly under the TV to get to the dressing room. (It was kind of adorable.) Still, the performance was magical and this program remains to this day, one of my favourite pairs programs ever. What did you think of Aliona & Robin’s Out of Africa program? Let me know in the comments! I figured this post would be appropriate seeing that Tessa and Scott’s new show was premiering today on W. This is a clip from the show. It makes me kind of sad because I always liked the idea of the friendly rivalry between these two and Meryl & Charlie. Then again, maybe they took this clip out of context so I guess I’ll have to watch this when it comes out. Anyways, on to business: Throwback Thursday! This Throwback Thursday features Tessa & Scott’s Mahler program. For me, I think this was the moment that defined the Olympics for me. I’m wary of nationalism and could care less about my country winning medals and whatnot but Tessa & Scott brought me back to watching figure skating and I was cheering for them all the way. I remember watching this program at its beginning stages where it was not as smooth and there was a lift at the end that incurred deductions for it being too long. There was also a time when the “Goose” lift ended with Tessa doing a half loop on Scott’s leg and landing on the ice. I was there at Skate Canada when they did this program and I could feel myself holding my breath as they danced this program. When they won the Olympics, I was in tears from the performance and joy. This program is almost the epitome of Tessa & Scott in a program. I enjoy watching these two most when I’m a little disheartened and lonely because they make me feel better by reminding me that there is love and that it is a beautiful thing. What did you think of Tessa & Scott’s Mahler program? Let me know in the comments! P.S. Here is a link to the first episode of Tessa & Scott’s show. I suggest you watch it ASAP since it’ll probably be taken down soon. It’s 6 weeks until Sochi begins so I decided that as a bit of a countdown, I will do a Throwback Thursday post every week until February 6th. Each Throwback Thursday post will feature the wonderful programs from the Vancouver 2010 season even if the video isn’t from the Olympics. The first Throwback Thursday post goes to Johnny Weir and his “I Love You, I Hate You” short program. I personally love this program because of how well it suits Johnny’s sassy attitude and at the same time shows off his athleticism. I’ll also admit that I adore the corset with the hot pink ribbons. What did you think of Johnny’s program during the last Olympics? Leave your thoughts in the comments section!